Gallium was discovered in 1971. It is a non-radioactive, non-toxic metal and have been widely used a semiconductors in various electronic devices. Dmitri Mendeleev predicted the existence of gallium in 1971 and named it eka-aluminum. He also predicted some properties of gallium which were later confirmed when the element was discovered . In 1875, Paul Emile Lecoq de Boisbaudran a French chemist discovered gallium through spectroscopically analysis of sphalerite and observing violet lines in spectrum . The element was named gallium after the Latin word Gallia that was the native land of French discoverer. Gallium is a not an abundant element and is present in about 16.9ppm in the Earth’s crust. It Gallium does not exist in elemental form in nature. Gallium is also found in scarce amount in minerals such as gallite . It is mainly present in the ores of aluminum (bauxite) and zinc. Commercially, gallium is produced through smelting of various ores, including bauxite and some ores of zinc sulfide. Gallium is bluish silver metal. It is soft at STP (standard temperature and pressure), while at low temperature, it acquires a brittle solid state. Gallium also exists in liquid form at temperature more than 29.76 °C. When gallium is held in the hand, it melts and is re-solidified when placed back from hand. Thus, the melting point of gallium is 29.76 °C. Melting point of gallium is used as reference point of temperature set by the International Bureau of Weights and Measures (BIPM). The boiling point of gallium is also unique, as it is the only element that has the greatest difference or ratio between boiling and melting point as the boiling point is 2399°C which is about eight times higher than its melting point. At high temperature, gallium has a low vapor pressure. 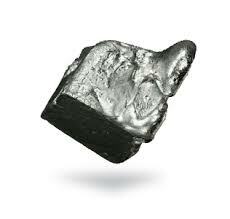 Gallium belongs to the boron group (Group 13) along with aluminum, indium, thallium and nihonium. When gallium is frozen, it expands as it solidifies, so care should be taken while storing gallium at low temperatures. In solid form, it forms an orthorhombic crystal shape with eight atoms that form a unit cell. Gallium also tends to supercool below its freezing point into gallium nanoparticles. Gallium is a high-density liquid. Gallium is not a very reactive metal. the most common oxidation state of gallium is +3. Gallium dissolves in strong acids and alkalis. Gallium dissolves in water and aqueous solutions of gallium have hydrated gallium ions. Gallium hydroxide is an amphoteric compound and it can dissolve in alkalis and produce salts of gallium. Gallium reacts with ammonia to form gallium nitride at high temperature. It can also react with antimony, arsenic, and phosphorus to form binary compounds. Gallium reacts with halides, including fluorine, chlorine and iodine to form stable compounds. Gallium does not react with water and air at room temperature due to the formation of a surface layer of oxide. However, at higher temperatures, gallium reacts with air to form gallium oxide. Gallium is widely used in electronic industry. It is part of infrared circuits, microwaves and efficient switching circuits. Gallium is used as a non-toxic alternative to mercury in thermometers. Gallium is widely used to make alloys that have low melting points. Gallium is used in the manufacturing of semiconductors. Gallium nitride semiconductors produce violet and blue light-emitting diodes and lasers. Gallium is used to make high quality jewellery, for instance gadolinium gallium stones that have brilliant looks that resembles diamonds or gemstones. Gallium is not a biologically significant element. It is a non-toxic element. Gallium is also a non-radioactive metal. There are thirty-one isotopes of gallium and their atomic mass range from 56 to 86. The stable isotopes are only two, gallium-69 and gallium-71. The most abundant isotope is gallium-69 and makes around 71% in abundance. All other isotopes of gallium are unstable and radioactive. Gallium-67 and gallium-68 are the commercially important radioactive isotopes of gallium. The lighter isotopes (below gallium-69) decay through emission of positron termed as beta plus emission while the heavier isotopes undergo electron emission that is termed as beta minus decay.
. de Boisbaudran, Lecoq (1835–1965). “Caractères chimiques et spectroscopiques d’un nouveau métal, le gallium, découvert dans une blende de la mine de Pierrefitte, vallée d’Argelès (Pyrénées)”. Comptes Rendus. 81: 493. Retrieved 2008-09-23.